Croissants are a classic French pastry that are often served for breakfast according to Cindy Mushet and Maren Caruson in their book "The Art and Soul of Baking." The ingredients and method of preparation are quite simple. 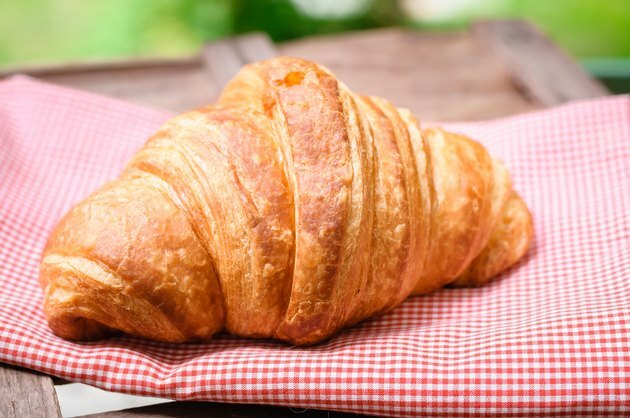 Because croissants are fattening, FamilyDoctor.org notes recommends eating fattening foods like them sparingly. A classic croissant dough, Mireille Guiliano says in her book "French Women Don't Get Fat," requires six basic ingredients. Milk, active dry yeast, all-purpose flour, sugar, salt and sweet unsalted butter are used to make the croissant dough. Guiliano says to lower the fat content you can use non-fat or skim milk without compromising the taste or consistency of the dough. She does not recommend, however, substituting the butter for margarine, as this will impact the way the croissant bakes. Mushet and Caruson say that a common butter block glaze is what gives the pastry its distinct browned flaking. Generally, the glaze only consists of a whisked egg yolk and milk. However, you can add butter and all-purpose flower to thicken the glaze for a darker and crunchier bite. Again, Guiliano does not recommend substitutions of egg white for egg yolk as this will affect the traditional color and taste of the croissant. There are several optional fillings and toppings you can add to your croissants. A healthy topping would include nuts like walnuts, almonds or pecans,.Toppings are sprinkled on top of the croissant before baking. Fillings are a little more diverse, ranging from meats like ham or sliced turkey with cheese to chocolate or fruit filling. You can use fresh fruit in lieu of candied or syrupy pre-packaged fruits to minimize fat and sugar content.